Mojo: mid-motor system for almost any bike! 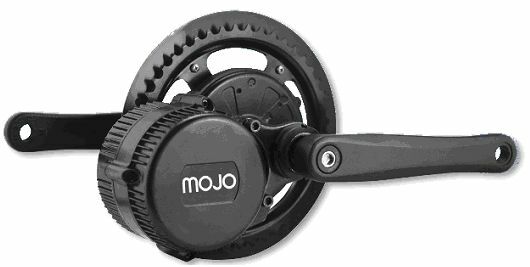 The Mojo is a light, quiet and powerful, system that adds electric assistance to your bicycle, tricycle or recumbent. 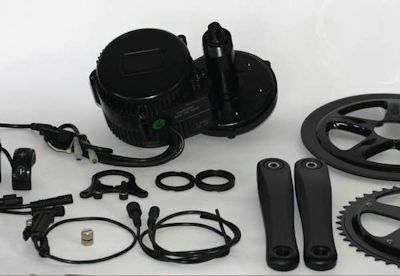 It replaces the whole pedal/chainwheel/bottom bracket assembly with a single, sealed power unit and a handlebar mounted console. Available now: £450 inc. VAT, plus shipping. 36V Battery from £145. Manual speed control +£25. Higher torque models available. In Automatic mode you simply set the amount of assistance you need and pedal: Mojo will add to your pedal effort and help you tackle hills and headwind in a way you will never have experienced. 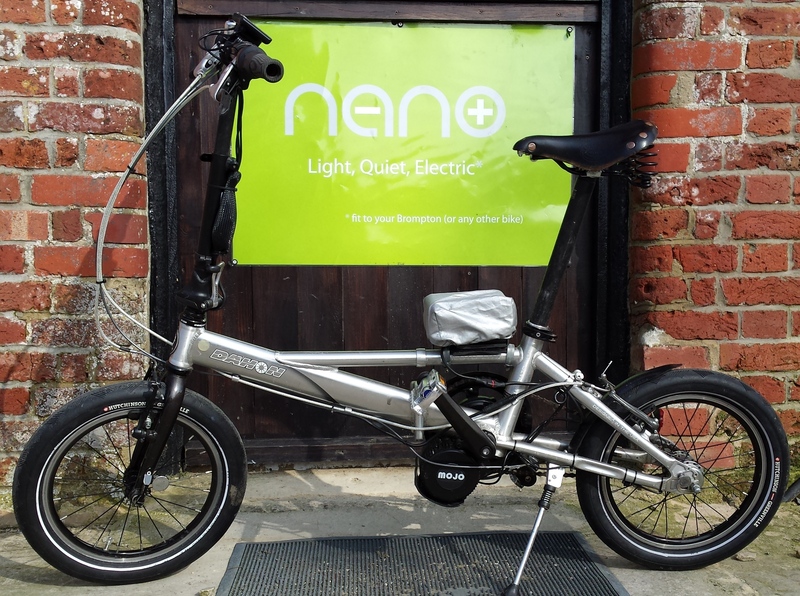 A Manual control is available to give you 'hands on' management of the motor as well as pedal Automatic mode..
For example, the 250W Mojo when fitted to a 16" wheeled Dahon will climb a 14% hill without pedalling! . Mojo more than pulls its weight! decibels won't mean much, but in comparitive terms Mojo is quieter than the clicking of a freewheel. It is not even as loud as the noise of the tyre on the road. Even on quiet lanes you won't hear the motor noise. No wonder it climbs hills so well! The pedal sensor needs just 30° rotation to activate leading to a more responsive Automatic operation. A speed sensor limits range of assistance: this is adjustable to suit type of use. Four levels of assistance are selected on the console by press button. This can be set from 1 to 9. The chainring has a freewheel so your feet won't get pushed round by the motor - safer, simpler. Battery symbol shows 5 steps of remaining battery charge. 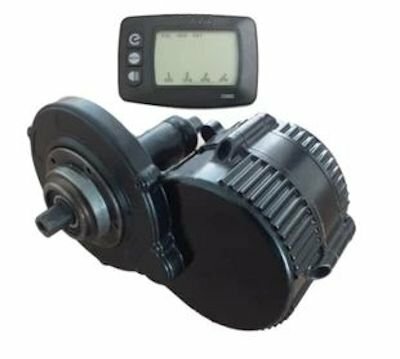 Operating either lever instantly cuts motor power. 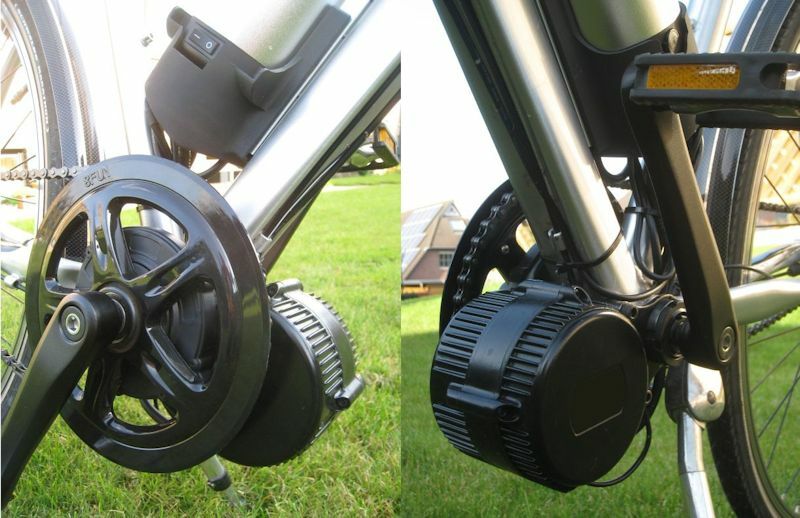 Retro-fit sensors let you keep your existing levers or you can use the switched levers provided. The Mojo fits inside the existing bottom bracket threads. It can be fitted and removed without damage. The standard batteries we supply are Lithium Iron Phosphate for lightest weight and long life. In addition to the £425 370 Watt/hrbattery and charger we offer a 162 Watt/hr Bosch Lithium Ion battery for £250. We also have a 95 Watt/hr battery for even less weight, and larger batteries for greater range. It is not possible to specify the range that can be covered because it depends on weight, wind, terrain and rider effort. As a rule of thumb, without much pedalling a range of 20 Watt/hrs per mile. i.e. 20 miles per 370 Watt/hr (36V 10A/hr) battery. 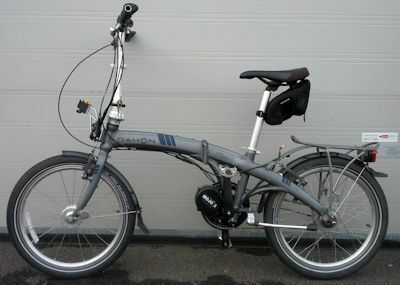 With average pedalling this can be doubled - 40 miles with a 36V 10 A/hr battery. For those who need a cheaper option where weight and long life is less important (eg Tricycle) a Lead Acid battery is available in various capacities. Buy Direct: If you want to use your own case or customise your battery, try our partner www.pingbattery.com We can supply a range of connector options. Fitting service available at regional locations and at your home (costs apply). Please contact us for details.